The contrabass master took listeners for an emotional ride at the Loft. 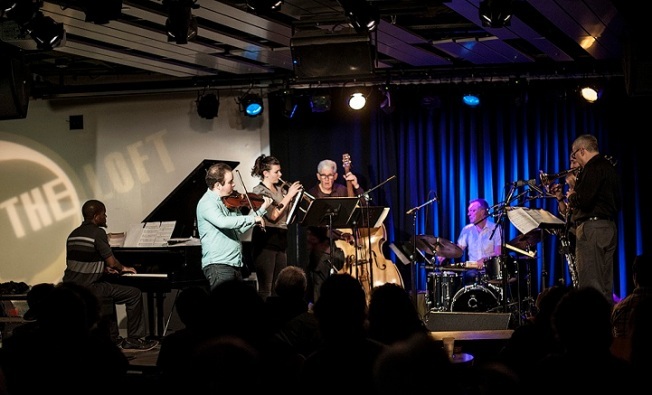 The Mark Dresser Septet performed at the Loft on Dec. 11. Bassist, composer and bandleader extraordinaire Mark Dresser brought a slightly revamped version of his latest septet (featuring trumpeter Stephanie Richards subbing for flute virtuoso Nicole Mitchell) with David Boroff’s violin, Marty Ehrlich’s clarinet’s, Michael Dessen’s trombone, Joshua White’s piano, and Kjell Nordeson’s drums into the UC San Diego's the Loft on Dec. 11. Things began with the stop/start free-for-all dynamics of the humorously titled “Hobby Lobby Horse,” instantly breaking into small vignettes for each player, eventually cycling back to opportunities for the fat smears of Richardson, the slinky sinew of Ehrlich, the violent romance of Boroff, the lurching, braying Dessen making way for White, who practically whipped the piano keys into submission before Nordeson danced across the skins. Dresser opened the second piece with a bravura a cappella demonstration of extended techniques, including two-handed bi-tonal tapping that released each of his associates into soft, atmospheric contributions, which took on the characteristics of five independent melodic voices coursing over the jagged contours of the rhythm section, exploding when White burst forward with the sound of unbridled joy and profound density. Dessen was next, inhabiting that lonely, 3 a.m. existential wail as only he can. Dresser rounded up the commentary with another essay that exploited the nearly impossible geometric choreography he seems to conjure with both hands. Next up was a brand-new piece, “No Gluten for Putin,” which opened on the x-rated, plunger-mute novella from Dessen as multiple melodies seemed to emerge from all corners of the stage, layering atop the symphony of soft clicks elicited by Nordeson, who has mastered the principal of maximum density with minimal volume as well as any percussionist I can recall. As Ehrlich stirred an indigo swirl, Dresser engaged his instrument with broad strokes and swaying gestures like a trusted dance partner. “Will Well” is dedicated to the legendary slide-trombonist Roswell Rudd, and like several pieces in the septet repertoire, it soared into the ether with lush orchestration, beginning with a bowed bass solo so rich in timbre that minds were blown even as heartstrings were caressed. An absolutely sparkling series of solos followed from Ehrlich’s impassioned multiphonics to the gypsy cry of Boroff’s dissonant intervals. Dresser even broke into a joyful four on “I Can Smell You Listening,” which tethered long glissandi over walking bass and a Joshua White solo that reeked of pure audacity in concert with the ever-creative disruptive waves of motion from the sticks of Nordeson, whose muscularity ripples like the back of a welterweight. As a composer, Dresser often engages emotions in multiple planes, so one can easily experience extremes that jostle between heartache and anger with as many gradients in between as a listener is able to imagine. On Dec. 11, all of these possibilities became realities, and everyone there is richer for having made the effort.